President Cyril Ramaphosa must guarantee that the restructuring of Eskom he announced in his State of the Nation Address on Thursday will not lead to job losses, the Congress of South African Trade Unions said on Thursday. In one of the major announcements of his address, Ramaphosa said government would start a process of splitting the debt-laden power utility into three parts – generation, transmission and distribution. These three separate entities would still fall under Eskom Holdings. "This will ensure that we isolate cost and give responsibility to each appropriate entity," said Ramaphosa. "This will also enable Eskom to be able to raise funding for its various operations much easily from funders and the market." Ramaphosa also spoke on reforms at cash-strapped state-owned enterprises, saying that the integrity and capacity of the institutions must be restored. He said state assets will not be disposed of if they are critical for the development of the economy. "Where SOEs are not able to raise sufficient financing from banks, from capital markets, from development finance institutions or from the fiscus, we will need to explore other mechanisms, such as strategic equity partnerships or selling off non-strategic assets," he said. 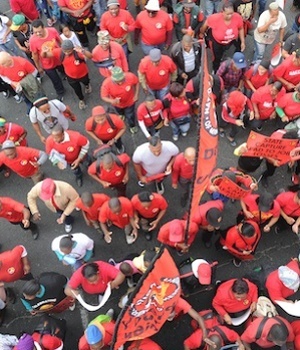 In its initial response to Ramaphosa's address, the country's largest trade union federation raised concerns about job losses, particularly at state-owned enterprises. Cosatu said it wanted more clarity on which state assets will be sold. The federation said the president had been vague about turnaround plans for SOEs which may affect jobs. "We appreciate the President’s commitment to a just transition. But he did not say what exactly does that mean. Workers only want one thing. Job security… Government must not think that retrenched workers will easily vote for a party that has handed them a dismissal letter," said parliamentary coordinator Matthew Parks. "We are disappointed that government is continuing to traumatise our SOE workers. It would be better to retrench those who collapsed these SOEs. Many of them are sitting in Parliament," he added.